PAOLO BALBONI (PH.D.) IS A TOP-TIER EUROPEAN ICT, PRIVACY & DATA PROTECTION LAWYER AND SERVES AS DATA PROTECTION OFFICER (DPO) FOR MULTINATIONAL COMPANIES. PROFESSOR OF PRIVACY, CYBERSECURITY, AND IT CONTRACT LAW AT THE EUROPEAN CENTRE ON PRIVACY AND CYBERSECURITY WITHIN THE MAASTRICHT UNIVERSITY FACULTY OF LAW. PRESIDENT OF THE EUROPEAN PRIVACY ASSOCIATION. LEAD AUDITOR BS ISO/IEC 27001:2013 (IRCA CERTIFIED). Paolo Balboni (qualified lawyer admitted to the Milan Bar) is a Founding Partner of ICT Legal Consulting (ICTLC), a law firm with offices in Milan, Bologna, Rome, an International Desk in Amsterdam, and multiple Partner Law Firms around the world. Together with his team he advises clients in the fields of Personal Data Protection, also acting as Data Protection Officer in outsourcing, Data Security, Information and Communication Technology (ICT) and Intellectual Property Law. Paolo has considerable experience in Information Technologies including Cloud Computing, Big Data, Analytics and the Internet of Things, Media and Entertainment, Healthcare, Fashion, Automotive, Insurance, Banking, Anti-Money Laundering (AML) and Counter-Terrorist Financing (CFT). Paolo is Professor of Privacy, Cybersecurity, and IT Contract Law at the European Centre on Privacy and Cybersecurity (ECPC) within the Maastricht University Faculty of Law, President of the European Privacy Association based in Brussels and Cloud Computing Sector Director and Responsible for Foreign Affairs at the Italian Institute for Privacy in Rome, Italy. He is involved in European Commission studies on new technologies and participated in the revision of the EU Commission proposal for a General Data Protection Regulation. He co-chairs the Privacy Level Agreement (PLA) Working Group of Cloud Security Alliance and has acted as the legal counsel for the European Network and Information Security Agency (ENISA) projects on ‘Cloud Computing Risk Assessment’, ‘Security and Resilience in Governmental Clouds’, and ‘Procure Secure: A guide to monitoring of security service levels in cloud contracts’. Paolo is the author of the book Trustmarks in E-Commerce: The Value of Web Seals and the Liability of their Providers (T.M.C Asser Press), and of numerous journal articles published in leading European Law reviews. Graduated in Law at the University of Bologna (Italy) in 2001, Paolo Balboni completed his Ph.D. in Comparative Technology Law at Tilburg University (The Netherlands) in 2008. He speaks Italian, English and Dutch fluently and has good knowledge of French, Spanish, and German. Paolo Balboni has been listed as a Recommended Lawyer for TMT in the 2017 edition of The Legal 500. ICT Legal Consulting has been listed as a Leading Firm for TMT. Paolo Balboni has been selected as the top lawyer in Italy for IT Law by Five Star Law. Paolo Balboni is a certified TÜV Privacy Officer and Consultant. 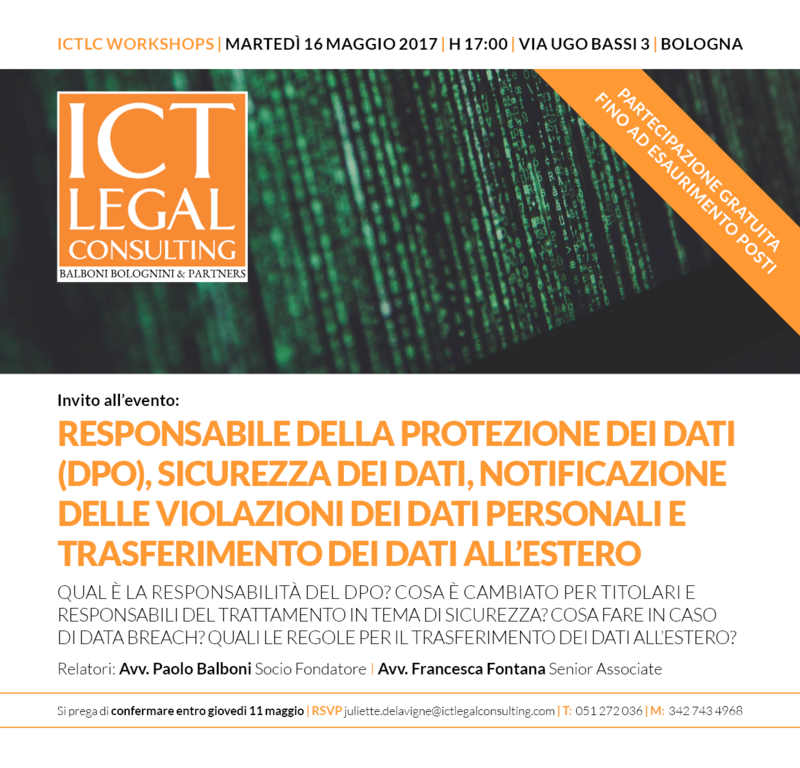 Data Protection Officer: qual è il suo ruolo secondo i Garanti Privacy Europei? E SE DA GRANDE FACESSI IL PRIVACY OFFICER? 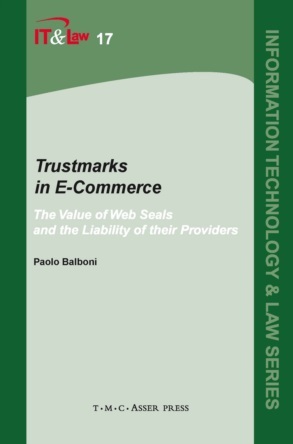 This groundbreaking book is the first comprehensive study of trustmarks: electronic labels or visual representations that indicate an online merchant has met industry standards with regard to security, privacy, and business practices.